One of my favorite pictures. We both looked pretty smitten with each other. Today I was told by one of the nurses that I get an “A+ for attendance” and thumbs up for being so involved with Mira’s care. I could pat myself on the back about what a great mom I am that I have seen Mira every single day since she’s been born (minus three days when I went back in the hospital). And give parents who haven’t an F. Or I could credit my smarts for my ability to engage with the doctors and nurses when it comes to decisions about my baby’s health. But then that would be giving myself all the credit and God none. And for taking my blessings for granted. I am blessed that at the beginning of the year God led me to quit my job to freelance – Mira unforeseen. And that’s caused me to have a more flexible schedule than most people. Or that I have a car to get back and forth. Or gas money. Or I live 20 minutes away. Or a great support system who also visit Mira. Or that I don’t have other small children at home. Or have been taught to ask questions until I understand. Or that I have no problem questioning authority. These might seem simple but are real issues. I got a reality check when I overheard a mom say that she would have to come back to visit her twins preemies in a couple weeks when she got money to ride the bus to the hospital. It broke my heart. Pile all these things on and parenting a baby in the NICU can really be a challenge. Through this experience, I’ve learned that half the battle with parenting is just showing up. Being present. That it really is a choice. And not always an easy one. While I’m lucky enough to show up everyday, I also admire the mom who’s baby is next to Mira who calls at least once every couple hours to check in on her baby during each of my visits. It seems like she’s moving and generally has life happening caring for her other children. But her concern shows and she’s making her presence known to the care team. Even if you have no clue what to say to the doctors, nurses or your baby, be present and proactive. 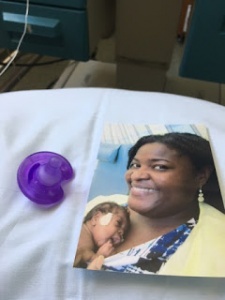 It’s easy to feel disconnected from your baby when it’s in an incubator and you feel like the nurses have a better handle on caring for them than you. It’s also easy to assume your baby needs more from the medical staff than you. That couldn’t be further from the truth. Just showing up, talking, touching, checking in, calling, caring can make a difference. 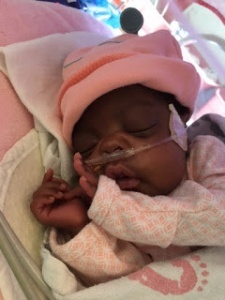 And if there are times where you have to choose what’s going on outside the NICU over parenting your preemie, don’t let the guilt consume you. enough to want to hear it. I want her to know when she started wearing clothes or when she started drinking from a bottle or about her growth and some of the ups and downs she had at the beginning of her life. I want to paint a full picture for her, from the time she was conceived and how she came into this world. I want to be able to fill in all the gaps for her until she has memories of her own. Each day I make it to see Mira is a day that I’m making a choice. And if there is a time that I am not able to see her, my call to check in or sending her love from wherever I am will be no worse a choice. But just as long as I’m present, then I’m doing my best. And I thank God for all the small obstacles he’s cleared out of the way of me being able to parent Mira and develop a beautiful bond with her from the beginning.